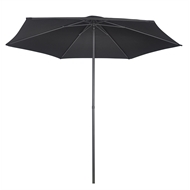 Ensure protection from sun or rain all year round with this 2.5m Marquee Market Umbrella and increase shade with ease in any backyard, decking area or courtyard. Featuring a solid steel tubular frame with a durable UPF 50+ rated polyester charcoal canopy that is perfect for outdoor use, resistant to water and weathering, providing stability and strength in the wind and rain. Make the most your outdoor living area with your very own marquee umbrella allowing you to relax and enjoy the outdoors in any weather.